Wetlands perform several functions: they prevent flooding, absorb nutrients and pollutants, collect sediment, support wildlife habitat and add appeal to the landscape. 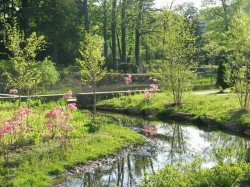 Photo courtesy of Nelson Byrd Woltz Landscape Architects. Many horse farms lack access to water treatment facilities. Their restrooms do not drain to sewer or septic systems. Unchecked storm water runoff can wash pollutants and sediment from manure piles, barns and heavily used pastures into nearby streams or other water bodies. A natural wetland catches and treats runoff for less cost than most other methods. Wetlands provide an alternative to septic tanks and leach fields. 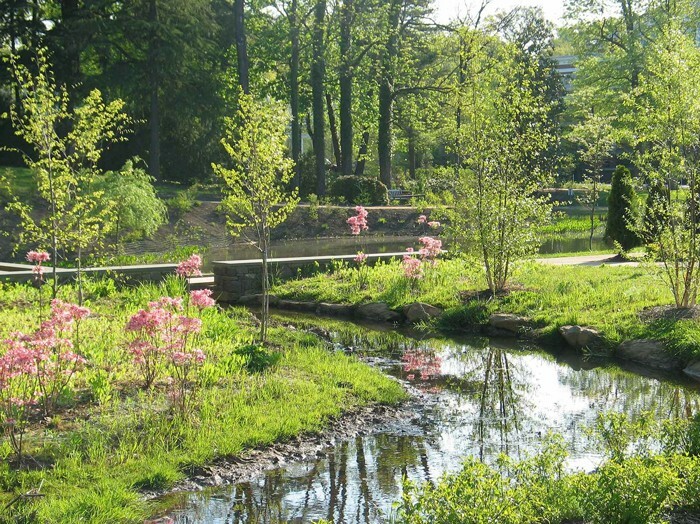 Constructed wetlands perform many of the functions of a natural wetland. Wetlands perform several functions in the watershed. They prevent flooding by temporarily storing storm water. They absorb nutrients and pollutants. They collect sediment that prevents soils from entering downstream water bodies. They support wildlife habitat and add appeal to the overall landscape. Wetlands store carbon. When released into the atmosphere, carbon contributes to global warming. Wetland areas hold water most or all of the time, aiding the decomposition process for surrounding species. Decaying plants and microbes produce abundant nutrients that feed many animal species. Wetland construction requires a relatively large land area. Locate and design the wetland to suit the specific environment and use, and avoid stagnation. Prevent livestock from entering the area. Engineered wetlands occupy a shallow depression with an impermeable bottom. Soil, sand, gravel, rock, organic materials, sediments and plant litter top the impermeable floor. Appropriate vegetation and, of course, water complete the construction. All wetlands require monitoring. Constructed wetlands especially need maintenance as conditions change. The Environmental Protection Agency offers an excellent manual for constructing wetlands. More information about constructing wetlands in your region can be found at your local Extension Office here or here.